Boutique Mansion with Breathtaking Ocean Views, Perfect for Couples. 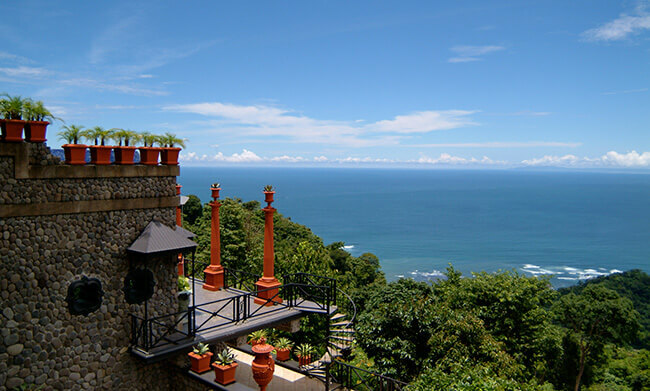 Zephyr Palace is set high above the Central Pacific Coast of Costa Rica, with an impressive view of the Nicoya Gulf. This boutique mansion with breathtaking sunset views is wonderful for couples, groups, and families with older children. The hotel’s name and design were inspired by the mythological Greek god of the west wind, Zephyros, standing out from the crowd of Jaco hotels with its unparalleled luxury and decadence. The Zephyr Palace has seven thematic luxury suites that have been carefully decorated. Every detail will transport you to a different time and style according to your room’s theme. Travel back in space and time to places such as ancient Egypt, the Orient, Africa, or the British Empire, or pick more recent period era decors – 1920s or the New World. Amenities include A/C, satellite TV, safe, hair dryer, minibar, coffeemaker, and complimentary WiFi. Zephyr Palace guests can enjoy Villa Caletas Hotel facilities, such as the El Anfiteatro Restaurant for breakfast, lunch, and dinner, or the Mirador Restaurant, which is open for dinner. El Pelicano Beach Bar, located on a secluded beach at the bottom of the property, offers refreshing beverages and delicious snacks. Additional amenities include a spa, gallery, three swimming pools, gift shop, nature trails, and fitness center.